Works with Verizon Fios Cable boxes model QIP, CHS,IPC, VMS series except QIP6xxx and QIP2500, also works with DTA271, DTA50 etc. 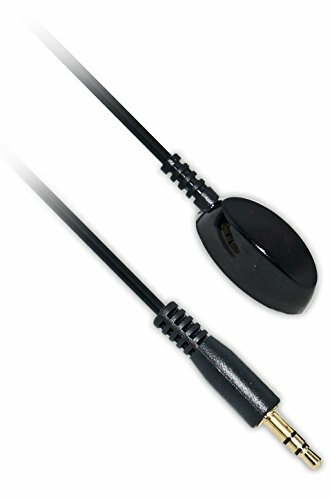 Will NOT work with A/V Receivers or IR Repeater kits. They require 12V receiver ours is only 5V. LOOK AT SIDE PICTURES TO COMPARE SIZE OF COMPETITORS. Ours is only 1/2in wide. Thinnest available! Perfect size to blend into current flat screen frames.Hide your cable box in a cabinet, down in the basement or A/V rack or room using this small (.53 wide x 1.12 long x .43in tall )IR receiver with 9 ft lead to 3.5mm gold stereo plug. Listed on Amazon since 2009 with 23 Years Expierence Manufacturing And Supplying The Cable And Hotel Industry. If you have any questions about this product by Infrared Resources, contact us by completing and submitting the form below. If you are looking for a specif part number, please include it with your message.